Amazing Tap is 360 degrees spooky adventure. 50 increasingly difficult levels await any one brave enough to lift the curse. Arm twisting fun as you rotate your device to control the Bumps. 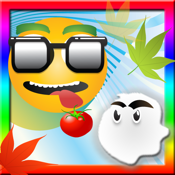 Evil Ghosts and Dracula Bats will try and stop you from smashing the Tomatoes and freeing the Bumps.